Brand New Item! Designed in The Netherlands! Right from the start, back in 1919, Brabantia has put all available knowledge, expertise and experience into developing solid reliable products that can last a lifetime. Today everything from their selection of raw materials to the design of the packaging must result in the attitude and core value of Brabantia durability. Brabantia's ambition is simple, to develop household products that retain their beauty and performance for up to the next 20 years. Its what drives the company, its who they are. Brabantia's Profile Collection is a professional range of kitchen utensils. It provides the perfect tool for every type of cook. An excellent choice for those who enjoy their cooking, from preparing a special 'Haute Cuisine' dish or just a daily home made meal. The Profile Line pastry and pizza cutter will slice through pastry and pizza with ease. 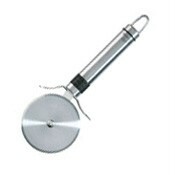 Cutting pizza's can be a dangerous job, but no longer with this dough and pizza cutter! It features a blade guard so your fingers are never near the rotating blade. Its large diameter blade makes it suitable for cutting deep dish pan pizzas. Easy to clean and dishwasher safe. The stainless steel hanging loop allows you to display and keep all your tools within easy reach. A matching hanging rail is also available. Slice through pastry and pizza with ease. Have all your tools neatly stored & ready at hand with the available hanging rack. Length 8" Width 2 3/4"